Since around 2005/2006 Nicole Richie has always layered a ton of delicate gold bangles and bracelets to created a unique look. I previously wrote about her Carolina Bucci bracelet, which Nicole Richie loves to layer on with other bracelets. Nicole Richie wears this bracelet in yellow gold but it is also available in rose and white gold. This stunning cuff ranges from $3200 - $4400 depending on special order for precious stones added to the eye detail. You can purchase Nicole Richie's Kathy Rose eagle cuff here. 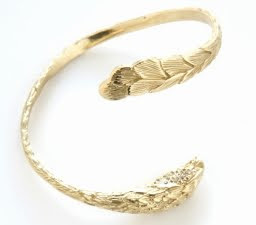 Nicole Richie isn't the only celebrity who loves the Kathy Rose Eagle cuff, Rachel Zoe, Taylor Jacobson and Rihanna have all been seen wearing this hot cuff layered with other gold pieces.